The dilemma of Chinese in film in the United States parallels the experience of Asian Americans in daily life, as they navigate being in the minority and contend with stereotypes. 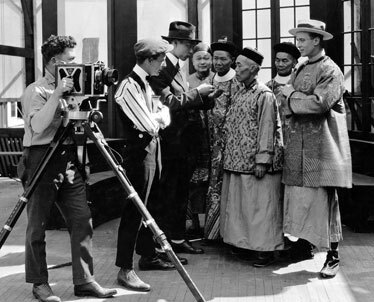 The appearance of Chinese actors and filmmakers in Hollywood film and television has been problematic since the first films appeared in the early 1900s. Arthur Dong's "Hollywood Chinese" documentary, screening as part of the 11th annual Hawaii International Film Festival Spring Showcase, retraces the struggle that has gone on for 100 years, with no sign of abating anytime soon. For those new to the controversies, Dong's work neatly captures the "progress" of Asian-Americans on screen through the decades, depicting the ways that each baby step forward is often accompanied by a leap backward. The dilemma of the Chinese in film closely mirrors that of the Chinese-American and Asian-American experience in daily life as a minority presence, marked by one stereotype after another. One of the best-known early Chinese actors, Anna May Wong, was frequently criticized for playing the only roles -- those of the victim, vamp or villain -- available to Asian women in the early 1900s. The same dilemma dogged Justin Lin's "Better Luck Tomorrow" in 2002. The film stirred controversy at the Sundance Film Festival, when it was criticized for its portrayal of a group of Asian-American teens as listless, amoral thugs. Dong's documentary shows the moment during the festival when a white man at a post-screening discussion accused Lin of failing to portray Asian-Americans in a positive light. At the time, film critic Roger Ebert came to Lin's defense, saying that the man's attitude was condescending because no one would deign to tell a Caucasian director what kind of story he should be telling. In the same way, Wong and Nancy Kwan, who portrayed the title character in "The World of Suzie Wong," were blamed for tarnishing the image of Chinese women by portraying prostitutes, a criticism never leveled against Caucasian actors. The perceived damage to the Asian-American community, according to film historian Stephen Gong, who was interviewed for the documentary, is that, "Films are about image-making and at our peril we sometimes misread and mistake the images we put up for the realities that we create." And for a Caucasian majority audience, at least in the early days of movies, the stories told on film were their only encounter with the Chinese culture. At that time, during the Chinese Exclusion Act, the Chinese and Chinatown were portrayed as a mysterious, alien place populated by opium addicts and cleaver-wielding killers. Laws that made it illegal for Caucasians to wed or kiss Chinese people made it impossible for Chinese actors to appear opposite Caucasians, and the resulting dearth of star power led to the birth of yellowface: white actors portraying Asians. Among those who took on Chinese roles were Katherine Hepburn, John Wayne, Boris Karloff, Tony Randall and Anthony Quinn. Most famously, Louis Rainer and Paul Muni were selected for the plum roles in Pearl S. Buck's Pulitzer Prize-winning "The Good Earth." " 'The Good Earth' woulda been, coulda been, shoulda been our 'Gone With the Wind,' " said Gong. Instead, the hiring of white leads turned it into "this great graveyard for all of our hopes and aspirations." For directors at the time, 1937, the decision to cast Caucasian actors was primarily a financial one. When the initial Charlie Chan films, cast twice with Asian actors, failed to capture the public's attention, a third was filmed with a white actor and became a hit. The series spurred the phenomenon of Chinese fortune-cookie speak, such that in 1986, Joan Chen had a diction coach on the set of "Taipan" to teach her how to speak the pidgin considered to be "appropriate" for a Chinese character. The film also documents the rise of the martial artist and the current wave of welcoming actors and directors from Asia who don't seem to have had the same trouble of integrating themselves into the Hollywood system, as have Asian-Americans. Director Wayne Wang, noting the acclaim showered on actors like Jet Li, Chow Yun-Fat and Ziyi Zhang, surmises, "Since they grew up, not in the minority, they had a sense of themselves that wasn't as compromised." The Academy Award-winning director Ang Lee, originally from Taiwan, said "We grew up and developed in Asia and we were the top guns. We were established before coming here, and if you grow up here, it's harder to develop to that status. "I think that's what it is. All of us speak worse English than most of you." His wish for all films comes from John Lennon's "Imagine," he said. "I hope there's no nation, no religion. People should live together and see what we are." Don't hold your breath. With the United States economy sinking, and China rising, you can bet Hollywood is already hatching new villains.